October is Breast Cancer Awareness Month, a term intended to increase public knowledge about a disease that is expected to kill 40,920 women in the US this year. Most Americans know about Breast Cancer Awareness Month through the hard-to-miss pink paraphernalia, which means solidarity – including the Breast Cancer Pink Ribbon, Rah-Rah slogans like "Think Pink" and other catch phrases that indicate breast cancer is something you can "survive and" beat ". 1; the incurable, late-stage type Being outside the chest to other organs like bone, liver, lungs or brain – feel no hope in October. And many They feel alienated and even outraged by the language of hope that pushes the campaign to the public. Breast cancer remains the most commonly diagnosed cancer in American women – less than one percent of diagnoses in men – and while survival rates are higher. According to some statistics, those with metastatic breast cancer do not have the opportunity to have a plan for them makes cancer free. "The whole Pink Ribbon, breast cancer awareness campaign focuses on making your mammograms and self-examining, it says, if you get diagnosed, you get chemo, radiation, surgery and then you are better, and we'll be celebrating and in pink tutus run, "said Rhonda Brewer of Michigan opposite Salon. "For those of us who suffer from metastatic breast cancer, we'll never stop chiming and say our breast cancer is healed, we're like the kids sitting in the back of the classroom getting a F and it's difficult to go into the shops and see everything pink. " The 49-year-old single mother is among the 6 to 10 percent of breast cancer cases each year who are initially diagnosed metastatic. Her Phase 4 diagnosis in May 2017 was a surprise as she only had a clear mammogram a few months earlier. It turned out she had thick breasts; As a result, her tumor, which spread to her lymph nodes, could not be detected by a mammogram. "Awareness [campaigns] was about mammograms, but there was not much about dense breast tissue," she said. "For the first few months, I was incredulous and shocked and was terrified of dying and leaving my children because I'm a single parent." According to a 2010 study by the European Cancer Organization (ECCO), 5 percent of total cancer research is spent on the study of metastases. Recent statistics confirm this. It is unclear how many people are dying from metastatic breast cancer because nobody has to report a metastatic diagnosis. Kentucky Lara MacGregor knows what it's like to live on both ends of the breast cancer diagnostic spectrum – which is one thing that's why she's trying to change the conversation about what it means to survive breast cancer. "I really want to try to focus on what it means to be a survivor and what it means to live with cancer, it's like a very American perspective, like, okay, you're a survivor, if you were cancer free for X months or years, "she said Salon. "It puts you in the future instead of being in the present." In 2007, at the age of 30 and 7 months pregnant with her second son, MacGregor found that she had stage 2 breast cancer. She had always lived a healthy life, she said, and had no family history of the disease. The diagnosis came as a surprise. After treatment she was "cancer free" for almost seven years. In 2014, MacGregor's life diminished once again when breast cancer was diagnosed. This time it was Stage 4 metastatic breast cancer. "I think you survive from the day you were diagnosed," she said. "It's not what happens after your treatment, I will not become a survivor when I ring and stop chemo, today I survive, so I'm a survivor, and if I can not always ring, because I'll never really finish Chemo then it steals me the opportunity to be a survivor. " When she was first diagnosed in 2007, she recalled nurses spoke positively about her prognosis. They showed her a roadmap, but the second time they did not. "It was dizzying to me, the difference between an early diagnosis and a metastatic breast cancer," she explained. "There was no nurse navigator, no timeline, what to do next, it was isolation and it opened the door to a whole other world: the elephant in the pink room." MacGregor became a social entrepreneur before her second diagnosis. She founded a nonprofit organization called Hope Scarves, which collects and ships scarves along with stories of people who have cancer. MacGregor got the idea when, after her first diagnosis, she received scarves from a friend of a friend with a note that said, "You can do that." The woman who sent the scarves to MacGregor wore the same scarves during her own treatment. She was so touched by the gesture that she treated others. What started with MacGregor, which delivered two to three Hope towels a week in their living room, became a tedious task: Volunteers and co-workers sent 50 scarves a week around the world today. MacGregor donated her first scarves to Roberta Szpara, who also faced early stage and late stage diagnosis. Szpara told Salon that in 2016, after being free of cancer for seven years, she found out in 2016 that she had come back and spread in the lungs and liver. "I think there's always an end in sight in early diagnosis, two to three years ago, of hormone therapy," she said. "They worry that your cancer can come back, but you keep moving in. Now that it's a deadly disease, it's very different and it's isolating, there's so much money and awareness, but we need more research to extend my life. " Following MacGregor's first diagnosis, she encouraged cancer patients to focus on surviving and beating the disease. 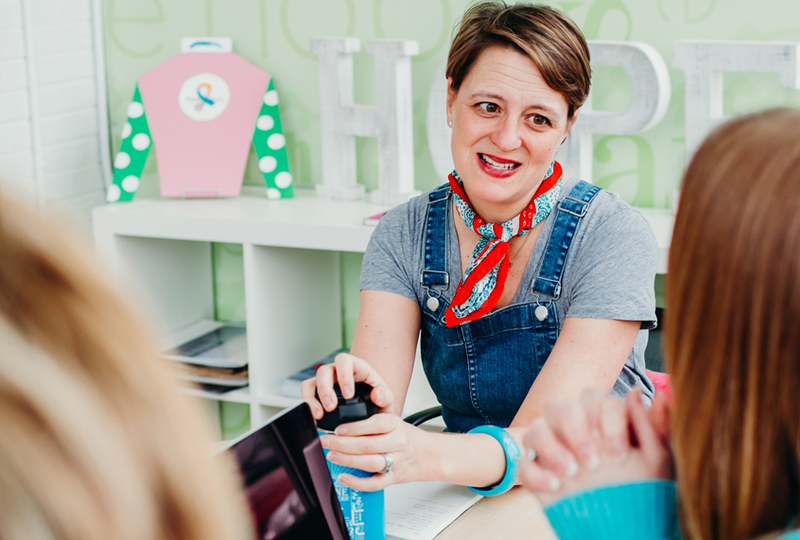 But after her second diagnosis of metastatic breast cancer, Hope Scarves removed the language from her website, which implied that hope was reserved only for those who "beat cancer." "Hope is not just about fighting cancer or surviving cancer and celebrating for many years you're cancer free, hope is not exclusive to these people," said MacGregor. MacGregor said her goal was not "to tear down the pink stage," but to bring more attention to finding a cure or finding a way to live off those with metastatic breast cancer. In 2015, Hope Scarves established a metastatic breast cancer research fund. Nowadays, part of every dollar donated to Hope Scarfs goes to translational research. "What drives me crazy is not the extent to which many things are rosy, I just really wish all the pink leads to something meaningful," she said. "Everyone can define that differently – everyone is right – but for me, this meaning comes in the form of research and money management to help people with metastatic breast cancer … for research that will help us find more treatments and extend the lives of people living with the most advanced stage of breast cancer. "